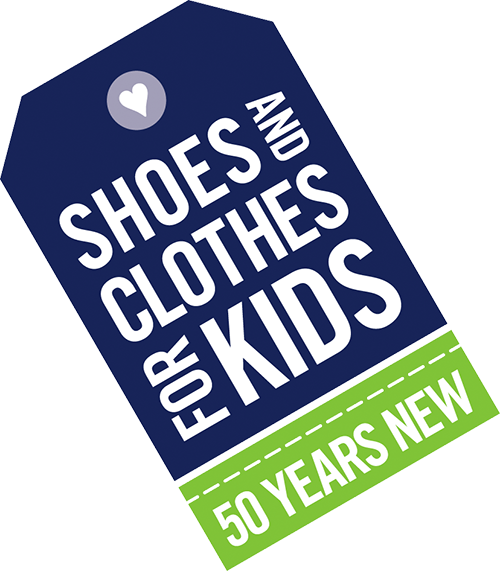 With a small professional staff, volunteers are critical to the operation of Shoes and Clothes for Kids. Without volunteers, we would be unable to sort, pack and distribute over $4 million worth of brand new shoes, clothes, and school supplies to thousands of children annually. Volunteers also play an important role in governing the organization on our board, advisory board and associate board, helping in the office, and assisting with all aspects of our special events. If you are ready to join us, fill out the Volunteer Form to indicate your interest and you will be contacted by an SC4K staff member. Socks, underwear, and school supplies are three of the most needed items for children living in poverty. You can help ensure that these basic essentials are something a child always has by holding a sock, underwear and school supply drive for Shoes and Clothes for Kids. A volunteer will work with you to identify the best time frame for your drive, help you determine how you will promote the drive and obtain a collection box and signage from SC4K for you to display at your collection site. Groups of volunteers (minimum 10 people) are needed at the SC4K and Cleveland Kids In Need warehouses in Cleveland to help count, sort, stock and pack items for distribution. A Packing Day is a fun, team-building opportunity that involves some physical labor (making boxes, opening boxes, moving boxes, stocking shelves). The warehouses are open from 9am – 3pm. Tuesday through Friday. Packing Days need to be scheduled for a minimum 3-hour time slot within these hours. Packing Days are scheduled based on the current inventory in the warehouses. We have multiple ways you can help out in the store: assist with teacher shopping, stock the store, or assist with administrative duties. Teacher shopping occur select Wednesday and Thursdays from 3:00 pm -6:00 pm and select Saturdays from 8:00 am – 1:00 pm during the school year and volunteers help with check-in and check-out process as well as assisting teachers with shopping. You will become acquainted with the shopping procedures and policies so that you can answer any questions the teachers might have. Stocking the store happens Monday through Thursday and Saturdays from 9am-2pm during the school year. Volunteers help stock, restock and stage merchandise throughout the store. Retail experience is a plus, but certainly not required. Founded in 2005, SC4K’s Associate Board leads a number of project teams that are geared towards young professionals who want to make a difference. These teams are open to any young professional volunteer who is willing to show up and do a little work. You may even have a little fun! More than 1,000 individuals volunteer with SC4K and Cleveland Kids In Need each year and help us to pack and distribute over 100,000 items to local kids in need… join our team!